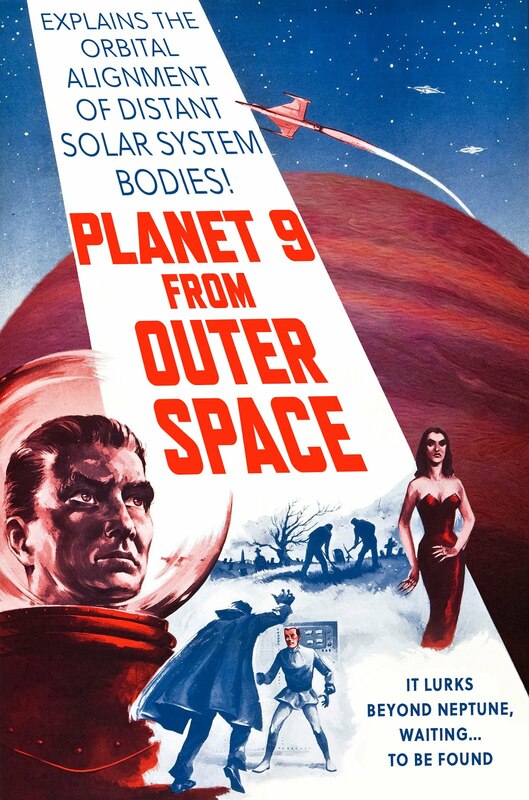 It has been an exciting and turbulent couple of weeks in Planet Nine land. The OSSOS survey has released their full data set, which in addition to over 800 garden-variety Kuiper belt objects, contains four little worlds with semi-major axes beyond 250AU. Together with the previously published data, this brings the count of distant bodies relevant to the P9 hypothesis up to 13 - a whopping 117% increase in the census of long-period KBOs, compared with what we had back in early 2016. So what story does the newly updated data foretell? Let’s look at the dry facts first. The membership of the primary orbital cluster that we pointed out in the first paper (shown in purple) has grown to ten. Meanwhile, two of the objects (shown in green) have orbits that are diametrically opposed to the primary cluster. Finally, there is also a single outlier, 2015 GT50, shown in gray. Cumulatively, this is a somewhat more complex picture than what we had a couple years ago. If you look at the OSSOS data in isolation, it contains two objects that are in the purple camp, one green orbit, and the gray outlier. You need to know exactly zero statistics to conclude that these four points DO NOT form a pattern. And this is what the OSSOS team concludes as well, after carrying out a sophisticated account for the observational biases inherent to their survey. Indeed, from the independent OSSOS dataset alone, a random underlying distribution (as opposed to a clustered distribution) cannot be ruled out. Perhaps the resolution lies in that observational surveys that discovered non-OSSOS objects share very little in their design with OSSOS, leading to staggeringly different biases between the OSSOS and non-OSSOS datasets. But one way or another, the likely take away message here is that although the data shows a statistically significant tendency for clustering, the emergent story is not as simple as that of all orbits with periods longer than ~4000 years (or equivalently, semi-major axes greater than 250AU) sharing a common orientation. Rather, the primary orbital cluster is accompanied by a diametrically opposed population of orbits, and is contaminated by an outlier. Let’s now compare this picture with theory. Numerical simulations of solar system dynamics that include P9 (e.g. BB16a BB16b) predict that beyond semi-major axis of 250AU, there will be a strong, long-term stable cluster of bodies with orbits that are anti-aligned with respect to the major axis of P9 as well as a weaker, metastable cluster of objects that are aligned with the orbit of P9. From an evolutionary point of view, objects belonging to the anti-aligned cluster are those that were scattered into distant orbits billions of years ago and were locked into an immutable, resonant pattern of anti-aligned perihelion libration. 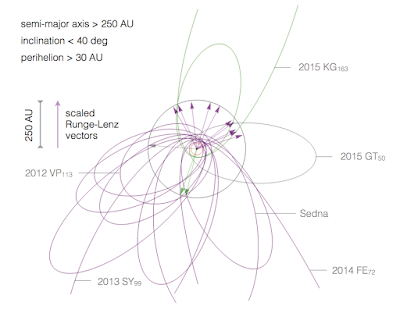 On the other hand, aligned orbits are those that were scattered out by Neptune (from a lower semi-major axis region) comparatively recently (e.g., ~ hundreds of millions of years ago), and due to mean-field interactions with Planet Nine will be ejected from the solar system as soon as their orbits precess out of alignment with that of P9. If we adopt this interpretation, the purple data points are drawn from the distribution of simulated objects shown in blue, while the green points belong to the orange population of test-particles. Although this explanation is comforting, we pretty much knew this already. So there is nothing particularly surprising here. The data point I got considerably more intrigued by is the outlier, 2015 GT50. As already mentioned previously, this object does not belong to either the aligned or anti-aligned cluster, so naively speaking it simply doesn't fit the model. 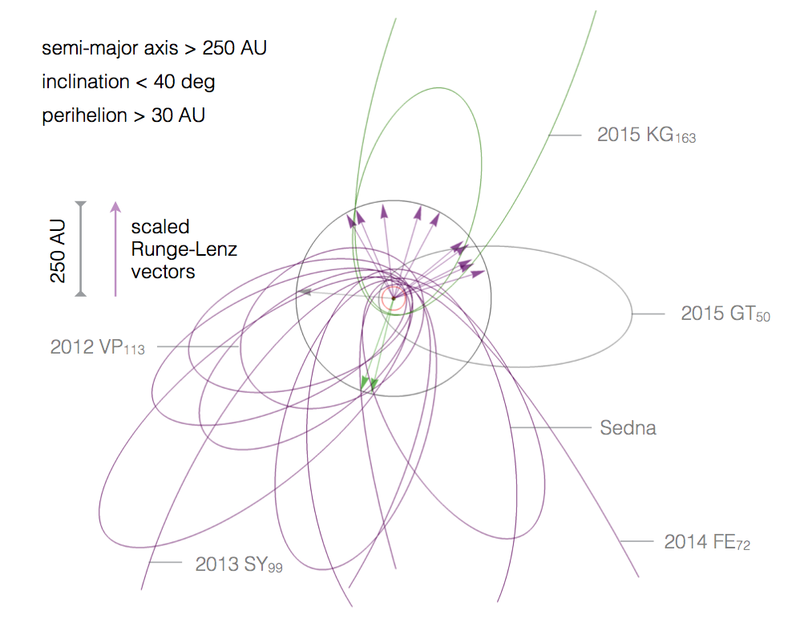 A more cursory inspection of the above plot however, brings to light the existence of a string of specific orbital radii that correspond to resonances with Planet Nine, where the simulated objects circulate through the full 0-360 degree range of orbital orientations. 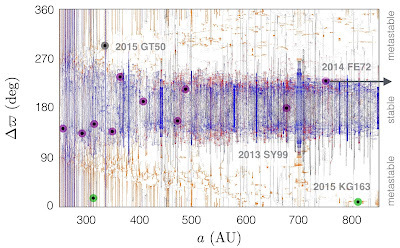 Remarkably, the outlier (2015 GT50) falls *exactly* on one such orbit (i.e. note on the plot above that the gray point falls on a vertical blue line). This is kind of staggering. Without changing the Planet Nine parameters at all (to make this plot I’ve adopted the same a=700AU e=0.6 m=10Mearth P9 configuration as in the original Batygin & Brown 2016 AJ paper), the model manages to fit all the data, including the supposed outlier. Of course, the fact that the observed object fits so well with theory might be a coincidence, but this correspondence nevertheless emphasizes that the mere existence of a small number of apsidally unconfined objects that do follow the overall pattern exhibited by the data, does not constitute strong evidence against the Planet Nine hypothesis. Instead, mapping out this comparatively uncommon population of unconfined objects might lend important constraints on P9’s semi-major axis. There is one other crucial aspect here, which is that the clustering of a>250AU orbits constitutes only one line of evidence for Planet Nine. If that were the entire story, the P9 hypothesis would have never made it to publication, because we would not have submitted the paper. Instead, what makes the theoretical case for Planet Nine compelling is its capacity to simultaneously explain (i) orbital clustering, (ii) dynamical detachment of KBO perihelia from Neptune, (iii) generation of perpendicular large-semi-major axis centaurs, (iv) the six-degree obliquity of the sun, as well as (v) pollution of the more proximate Kuiper belt by retrograde orbits. In my view, it is only when these pieces of the puzzle are put together that Occam’s razor begins to cut in Planet Nine’s favor. But in the end, time will tell - unlike many theoretical questions, the existence of Planet Nine has a well-defined observational resolution, and we’ll know the answer in less than a decade. There are several notables in the graveyard of ideas for more planets: Vulcan to explain Mercury's orbit, instead resolved by Einstein's General Relatively, Planet X to explain discrepancies in Uranus and Neptune's orbits, instead resolved by more accurate measurements of the ice giants' masses, a crazy idea for a companion star very far out, Nemesis, to explain periodic extinction events on Earth, which are likely more easily explained other ways, a destroyed fifth planet to explain the asteroids between Mars and Jupiter, and even wilder ideas. So, yeah, such proposals warrant lots of skepticism. 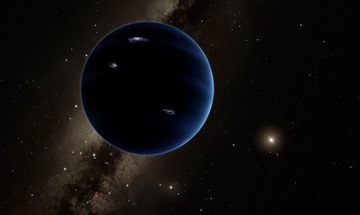 Now there's a proposal for a tenth planet about the size of Mars, between Neptune and the hypothetical Planet 9: https://www.space.com/37295-possible-planet-10.html How seriously should we take that notion? P10 would have to answer two questions: how does it coexist with Eris which orbits nearby, and how did it get where neither Neptune nor P9 could reach it? Eris is not massive enough to affect anything significantly. 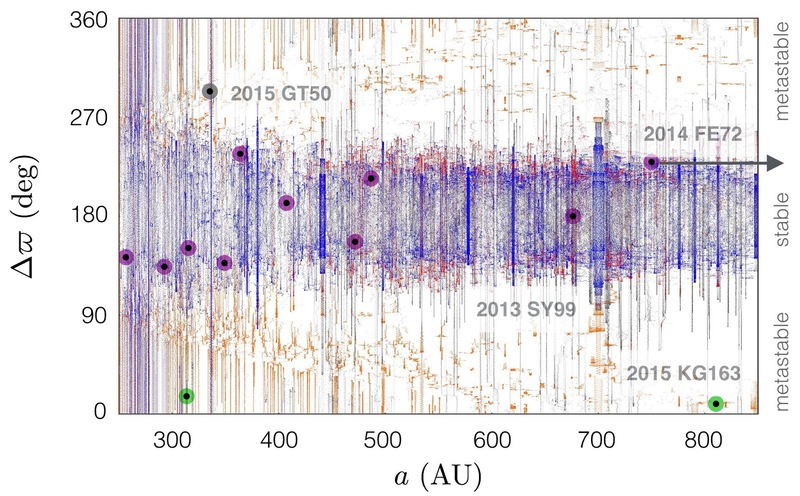 Coincidentally, semi-major axis of ~100AU is right between the regions of influence of Neptune and P9, provided the perihelion distance significantly exceeds ~40AU. I meant it the other way around - P10 affecting Eris. Of course, if they were in orbital resonance that would explain how they could be in the same orbital range. Great question. You are absolutely correct to point out that the number of failed planetary proposals is staggering. The gravitational influence of a planet beyond Neptune is perhaps the most unsuccessful idea in the history of astronomy. So can *any* such proposal be taken seriously? One guiding principle to thinking about this question, in my opinion, is Occam's razor. Put simply, does the planetary hypothesis present the simplest mathematical solution to the observed data? Clearly, in the case of Planet X as a resolution to post-1846 residuals in Uranus' motion, the answer is no... Although hindsight is always 20/20. A ~0.5% error in Neptune's mass provides a much simpler (i.e., fewer adjustable parameters) solution to the problem. In case of Planet Nine, there are five observational puzzles that are resolved by its existence. These are the issues enumerated in the final paragraph of the post. So if P9 is not there (which remains a distinct possibility until it is observed), we would have to come up with five separate theories to explain each of the observed phenomena. In this sense, the ability of P9 to act as single, unifying model for observed anomalies in the distant solar system makes it theoretically attractive, and deserving of further consideration. How many outliers would you *expect* from your trend? At what point do you say "we have too many outliers, this idea doesn't work"? Conversely, if all apparent​ outliers in the future turn out to be resonances like this one, at what point would you have to modify your idea to include a much higher mass planet or multiple planets or something, because of a lack of expected deviations from the trend? We never really worried about these relative fractions until now, because we didn't have any data to compare to. So I don't yet have a definitive answer. As a benchmark, for a ~20Mearth P9, the clustered population outweighs the non-clustered population by a bit more than a factor of ~3, but this number depends somewhat on the initial conditions of the Kuiper belt you adopt, as well as the chosen orbit of P9. So following to constraints you did there, you would expect to have 3 outliers to the trend out if the 13 bodies found so far, but you only got one, if that. And I would expect the higher end of the mass range (which would be 20 Mearth if 10 Mearth is what you initially modelled?) would cause the bigger clustering? So does that mean that you've "got lucky" with the large number of clustered bodies so far and you would have expected less? Possibly. One thing we consistently worried about is that the clustering in the model was never quite as good as it was in the original data. Perhaps this problem is going away on its own. Nice post! Are the new objects helping to narrow the possible orbit of P9? Thanks. Not really. The objects fit rather well with the model we already have, so no strong handle there for improvement. we've worried about that now and then, but the other key points about the anti-aligned objects is that they all have ~similar pole positions (see a few blog posts back). the anti-aligneds are definitely behaving as expected, and the others aren't, so I think we're OK. Doesn't the solar obliquity also indicate that you have the correct groups of aligned vs anti-aligned? Not quite. The *longitude* of the solar spin axis encodes information about P9's orbital plane, but not perihelion direction. "A more cursory inspection of the above plot however" - I think you mean "less cursory". Cursory means 'casual' or 'not very careful' and I assumed that you intended the opposite meaning. But I'd like to say how much I enjoy your fascinating posts, thanks very much for writing them! Thanks for the update. I made some charts for the 4 new ETNOs on the wikipedia article as well. For fun I also made a 12,000 year animation in 6 minutes of the solar system as viewed from the hypothetical P9, accidentally suppressed the dates, but all 13 ETNOs converge near Neptune at about @3:30. It gives a slight visual hint what a small sample our current 13 objects is from any full set of such objects. There has to be hundreds or thousands if we could observe for 10,000 years since they're mostly invisible much further away from the sun than perihelion, and spend most of their time closer to aphelion. Totally cool. Thanks for your effort! I think he's saying the tilt between the plane of the ecliptic and the sun's equator tells you something about the plane P9's orbit would be in but, unlike the clustered KBO orbits, doesn't say anything about which way the long axis of that orbit would be pointing. Hey Friends, This is emily and I like to watch movie online in Hd at home wheneer i get free time from my work.More information on solarmoviecom on solarmoviecom.com. it's going to be intriguing to see magic come alive again on the huge screen on yesmovies. we are going to discuss how to download and use Lucky Patcher Latest apk on your Android device. So, let’s get into the topic without wasting any time. You can not only watch Latest Showbox Movies but you can also download them directly on your Android device. The interface is very smooth; you can sort the movies according to IMDB ratings, name and so on.